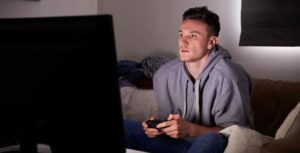 An addiction to video games or computer games should be treated in much the same way as any other behavioral addiction. Like other addicts, compulsive gamers are often trying to escape problems in their personal lives. Indeed, studies have uncovered a strong correlation between gaming disorder and symptoms of depression, anxiety, and ADHD (1,2). Of course, researchers are still trying to come to grips with fast emerging science but the evidence strongly points to a “two-way” relationship between gaming addiction and depression. In straightforward terms, this means a vicious cycle emerges in which gaming addicts increasingly retreat into video games to escape their problems, only for this behavior to further exacerbate those very problems. Families and loved ones often find themselves deeply frustrated by the inability of a gaming addict to simply throw down their controller and stop playing. At the very least they hope that their friend or relative will accept that they need help. Unfortunately, denial is a hallmark element of addictions of all varieties. As human beings, we are all prone to rationalizing our flaws and mistakes, and so problems as serious as addiction can be particularly painful to readily accept. There also appears to be a neurological element to gaming addiction. Studies of teen gamers have identified brain changes associated with increased dopamine production, similar to those found among gambling addicts (3). Often, video game addiction is further complicated by the presence of underlying symptoms of depression, anxiety, or another mental illness. A 2-year study following young “pathological” gamers came to the conclusion that poor social skills and impulsivity act as key risk factors for developing gaming addiction (4). Meanwhile, symptoms of depression and anxiety, as well as poor performance in school, appeared to be primarily a result of compulsive gaming. Because prolonged gaming addiction is often a vicious cycle associated with the breakdown of interpersonal relationships and other life pursuits, early intervention is critical in order to minimize harm to the affected individual. The purpose of this analysis is to underline that overcoming gaming addiction isn’t easy. It requires patience, determination, and in many cases, outside help. Video and computer games offer a particularly appealing escape to socially maladjusted teenagers, most often boys, who find it intoxicating to become immersed in a world completely under their control. When they play, their brains produce dopamine, giving them a high similar to that experienced by gamblers or drug addicts. Gamers’ responses to questions even mirror those of alcoholics and gamblers when asked about use,” said one addiction counselor. But there is another very real challenge when quitting an activity that occupies all of your free time and involves pretty much everyone in your social network. Kids who are addicted to virtual reality have lost, or may never have had, the ability to comfortably communicate with people face to face. They’ve spent all of their time interacting in a virtual world and are extremely uncomfortable when dealing with real people in real time. In an online world, there is time to edit what you say. There’s also very little risk when the person you are talking with is in a different time zone, let alone a different country. Shy or socially awkward kids are at greater risk of video game addiction than children who compete in sports or participate in group activities like afterschool clubs. As anyone who has quit smoking or been on a diet knows, it is much harder to quit when the object of your addiction is always in your face and when everyone you know is participating in it. It’s likely that a child addicted to computer games also has to use the computer for schoolwork. And their friends are likely all gamers as well. So how do you begin to fight the addiction? A therapist or treatment program that specializes in gaming disorders is the first place to start. Gaming disorder is a behavioral addiction that can be especially difficult to treat. Often, the affected individual is part of a social group that also heavily revolves around gaming. In addition, computers are an unavoidable part of daily life. For this reason, gaming addicts need to learn strategies that help them re-establish a healthy relationship with technologies that may previously have been their gateway into a life of compulsive gaming. Cognitive behavioral therapy (CBT) is a tried and tested method that helps people to break unhelpful patterns of thought. CBT aims to foster rational and healthy ways of thinking that can ultimately help modify feelings and behavior in the patient. Ideally, try to seek out a therapist with prior experience working with gaming addicts. In severe cases, residential inpatient centers may provide the solution that the gamer needs to readjust their lives and rediscover purpose. They offer a more intensive regimen of therapy and a chance to effectively ‘detox’ from gaming. Helping gaming addicts re-engage with activities and hobbies that they previously enjoyed can be a good way to bring them out of the world of gaming and back into reality. If you’re suffering from gaming addiction yourself, finding outside pursuits that bring you joy can help in discovering an alternative way of living. Relationships with loved ones, family, and friends are vital to all of us and one of the most insidious consequences of addiction can be the breakdown of those bonds. Remind yourself that there are people who care and make the effort to let your guard down and open up to those around you. These people can be important allies in getting the help you need. It’s also worth reminding yourself of your life goals and the ways in which gaming addiction will interfere with or sabotage those aims. Whether its your personal or professional life, excessive video game use can ultimately undermine or wreck your ability to achieve your dreams. Therapeutic boarding schools and wilderness camps for teens that specialize in treating addiction and behavioral issues may be an option for your child. For example, a summer camp or wilderness program will get your child out of his or her normal environment and into a situation where they’re forced to experience reality. Their time will be filled with activities that are designed to instil confidence, develop healthy passions, and foster social skills. Of course, choosing the right program, preferably one that has a therapeutic element, will be essential. Sending a socially challenged child to a rough-and-tumble military or boot camp with highly competitive activities could do more harm than good.